It’s nearing 1 pm and the marine layer is just beginning to burn off at the 2000 ft high McFadden Farm in Potter Valley, Mendocino. It’s here where Mike and Anne Dashe harvest their grapes for their renowned Dashe Cellars Dry Riesling. These organically certified, 50 year-old vines grow in a distinct micro-climate with warm days and cool nights, allowing the grapes to ripen slowly and develop complex flavors. This terroir is perfect for making aromatic, lovely dry Riesling—a complete change of pace from traditional, sweet German wines made from the same varietal. A glass in the kitchen and a bottle on the table! Try this amazing recipe that pairs perfectly with Dashe Cellars’ Dry Riesling and uses Riesling to make this savory pork-and-cabbage dish. To make the pork: place the pork shoulder in a large roasting pan. In a small bowl, stir the salt and sugar. Spread the mixture all over the pork, coating the top, bottom, and sides. Cover tightly with plastic wrap and refrigerate for at least 6 hours and up to 24 hours. Preheat the oven to 300°F. Remove the pork from the refrigerator and pour off any juices from the bottom of the pan. Roast the pork, fat-side up, until the meat is pull-apart tender and a nice brown crust forms on the exterior, about 6 hours. Once juices have accumulated in the bottom of the pan, after about 1 1⁄2 hours, begin basting with the pan juices every hour or so. Transfer the roast to a large platter, cover loosely with foil, and set aside at room temperature for up to 1 hour before serving. To make the salted cabbage: trim the bottom of the head of cabbage and separate the leaves. Reserve the larger outer leaves and the smaller innermost leaves to make kimchi. Layer the medium-size leaves on a large rimmed baking sheet, sprinkling each leaf evenly with a generous dusting of salt between each layer. Set aside at room temperature until the leaves are wilted and pliable and have given up some of their liquid, about 2 hours. Rinse the leaves well under cold water to remove excess salt, then pat dry. Wrap the leaves in plastic wrap and refrigerate for up to 1 day. To make the Ssäm Sauce: in a small bowl, whisk the scallions, Riesling, dwenjang, gochujang, vinegar, sesame seeds, and sesame oil (the sauce will keep, covered, in the refrigerator for up to 3 days). Arrange the salted cabbage leaves, lettuce leaves, and herb sprigs on a large platter. Put the Ssäm Sauce, sliced cucumbers and chiles, and hoisin sauce in small bowls, and the kimchis and steamed rice in medium bowls. Place the pork shoulder in the center of the table with two large forks for shredding the meat from the bone. Let everyone build their own wraps, filling the salted cabbage and fresh lettuce leaves with shredded meat and accompaniments. 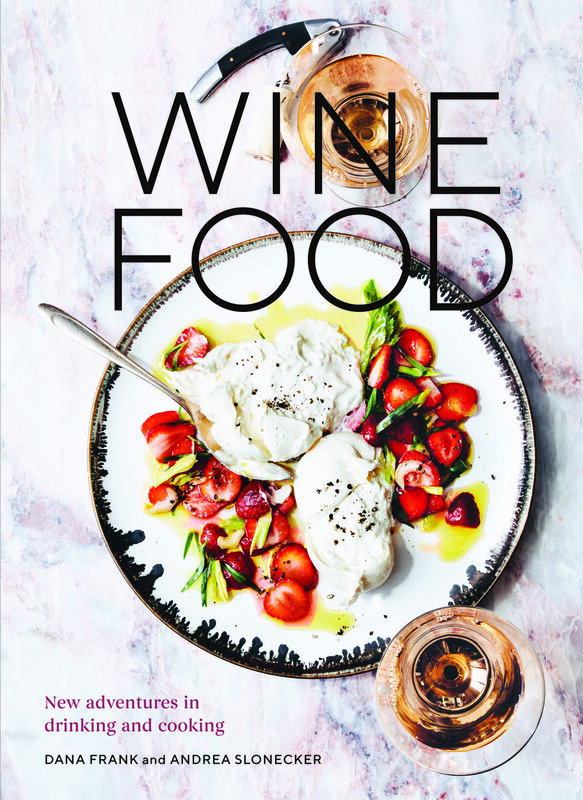 Reprinted with permission from Wine Food, copyright 2018 by Dana Frank and Andrea Slonecker. Published by Ten Speed Press, an imprint of Penguin Random House LLC.